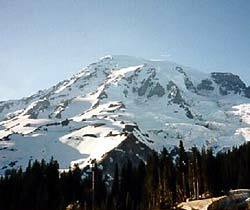 Want to climb Mt Rainier this summer? It'll cost you. I went to an informational meeting at my local REI store last night, sponsored in large part by Rainier Mountaineering Incorporated, the pre-eminent professional guide service in these parts. The talk WAS very informative--I was informed that I'll have to part with $1200 if I want to join them in a 32-hour experience on Mt Rainier this summer. Included in that princely fee is a mini-mountaineering class (conducted separately from the actual climb), and the rental of specialized climbing equipment you'll need, unless you happen to have a pair of $350 Koflach plastic boots in the closet, as well as a mountaineering down parka, crampons, ice ax and other goodies that will help make the summit climb do-able. I'm not complaining, though maybe it sounds like I am. RMI has a well-deserved reputation as one of the best guide services in the country and their presentation last night, though well-rehearsed, was solid and objective. Judging by the standing room only audience, they won't be lacking for clients this summer. They have a very good climber to guide ratio of 3-1 and if anyone can get you to the top, it's them. Already many popular weekends are filled and by the time the real climbing season starts in May, much of the summer will booked. What does $1200 get you, besides the orientation class, guide services and rental gear? Well, you get to stay in RMI's private hut at Camp Muir where most climbers spend the night prior to making the summit attempt. You also get a virtual guarantee that a summit attempt will be made, in almost any kind of weather, which is important for the many climbers that come from out of state. Last, but not least, your entire mental focus can be on physically completing the climb, putting one foot in front of the other, without the distractions of weather conditions, routefinding and logistics, all of which require a lot of effort when trying to bag a serious peak like Rainier. Don't have $1200? No problem, just get together some buddies and buy a climbing pass and wilderness camping permit for about fifty bucks. Contrary to popular belief, no training or experience is required to apply for the permit and there is no minimum equipment required. You just have to promise not to climb solo. As someone once said "Just Do It." Of course, there may be some complications. You might get to Camp Muir and find there's no room in the public hut and since you didn't bother bringing a tent, you'll have to trudge back to Paradise and try another day. Or you might get lost in a whiteout, which above 10,000 feet can happen on any day of the year. Then there's always that pesky crevass you could fall into, or the icefall/avalanche, or you could get sick or hurt and can't continue...well you get the idea. Each year, National Park Service rangers report registered "climbers" attempting the summit in high-top tennis shoes and sweat shirts. Think you can save a few bucks by going with another professional guide service? Think again. Of the 5 or 6 other licensed guide services on Rainier, they all charge about the same, if not more, than RMI. And unlike RMI, most of the other guides will be much more in your face about conditioning and their insistence on your completion of a very strenuous pre-climb mountaineering course. Speaking of conditioning, a potential climber asked the question last night: When should she start working out in preparation for a Mt Rainier climb this summer? The somewhat predictable answer was "Yesterday." The RMI guides recommend a minimum of four months of specific and intensive conditioning for the successful completion of the climb. They suggest a regimen of cross-training to include running, stair climbing, swimming, bicycling, etc, as well as upper-body conditioning. Additionally, you must get out on weekends and do some real climbs, complete with a 40 pound backpack, preferably on snow. Highly recommended is at least a couple full-dress rehearsals to the base camp at Camp Muir. Proper conditioning is the prime factor in whether your summit attempt will be successful. Want some inspiration to help get you up those nasty 40-degree slopes? The offical record for the quickest summit climb (from Paradise, round trip--about 18 miles) is a mind-boggling four hours. It took this freak of nature just 36 minutes to make it to Camp Muir, which is normally a 4-5 hour slog. I would love to do the summit climb and am sure I will someday, but money's a little tight this year so I may have to put it off. Maybe a September climb will work--we'll see. In the meantime, I'm looking at the next best option. The legendary RAMROD (Ride Around Mt Rainier in One Day) bicycle ride is coming up. Physically, it's just as demanding as the Mt Rainier climb, although it may be somewhat lacking in terms of iconic appeal. But at just $80, the ride is an absolute bargain. That's a big chunk of money. I'm pretty sure I wouldn't dream of doing it at all and certainly not without the leadership of experienced climbers. I'll bet you do it some day. I'm still thinking a bit about Ramrod, though I'm afraid that that doesn't appeal much either--for all my talk of wanting to do a mountain climb. I must say, though, that looking at the Ramrod profile, makes me think I might be able to do it and raises my willingness from zero to about three or four percent--a big climb at the halfway point, a smaller one (Cayuse, small!) at the three quarters mark and some checkpoints, with sweepers, I might be able to meet. You've got (I'm not including myself yet) the month to decide. As for myself, I'm just trying to learn how to do the html tags.